Just last night I rolled out my new freelance service plans and a great automated system behind it that sells those services as products and directs my customers to an order form to complete the process. I’ve also added different layers of customization services where the value of my skills as a web designer + developer can make my clients blog stand out further once it’s up and running. In this post, I want to show you the tools I used to create this system and the mindset that lead me to its creation. But let’s take a step back first. Did you notice some of the words I used in those first few sentences above? See, I don’t want to confuse you and give you the impression that automation means easy. In fact, it took me years of experimenting with blogging, freelancing, and my product business before I could put it all together into a bulletproof service. I started my first serious blog in 2007 and learned all about writing on the web, networking with others, and maybe most important of all: the technical details of setting up a WordPress blog. From simply learning how to setup and install WordPress I learned how to code and create my own blog designs. I had no idea just how valuable these skills and growing pains would be. Through my experience building a blog that had over 5,000 subscribers, I started freelancing to build blogs for others. This was a success but my readers loved the design I made for my own blog so much that they wanted it for their own. After years of hearing these requests, I turned that design into a product in 2010 and found my first real success making money online. The product went on to earn five-figures that year which made to be some nice pocket change for my 17 year old self. From there I built more and more products that would eventually put me on the path to making six-figures with my business. While helping thousands of my customers and readers over the years I learned how people like to build blogs and how I could constantly improve the architecture of my products to ensure I was always delivering the highest quality products to my customers I could. From all that came my pride and joy, Marketers Delight, which allows me to distribute my knowledge and experience into one product anybody can use to do what I do: make a living from their own products and services with their blog. The most important part of offering any kind of service is that you know what you’re doing. You don’t need to know everything, but the more skill and experience you can bring to the table the higher quality your services can be. It’s the same as the staple blogging advice— don’t blog about something you know nothing about. It took me years of feeling out my own business and my strengths/weaknesses before I could connect the different pieces I had collected (my product, skills, services, and value) into something solid. But don’t think I’m done improving and iterating my model, no. The game is just getting started and if I may let you in on a little secret: it never ends. As long as I’ve been doing this, I still don’t think I’ve peaked in what I can do. No amount of automation or use of the tools I’m about to talk about below will get you anywhere without a solid offer and commitment. Your tools are only a means of enhancement, not delivery. Use them wisely and use them skillfully. Before I even knew how I could setup an automated system for my services, I needed to define my offer. I’ll be speaking in the context web design but this thought process can be applied to the field you’re in as well. This was easily the most challenging part for me, as you may find yourself, since the depth of my skillset reaches so far and I could offer all kinds of services. For the debut, I will only offer 3 plans to choose from. All service plans will require the use of Marketers Delight. I will be as clear and as direct as possible to sell my service like a product. Simplicity is the most important part of this because I wanted to create a stream of income for myself that would require less work than a traditional approach to freelancing which is to take on nearly any project that interested me. See, rather than offering everything I know I can do, I packaged up the most essential parts of my capabilities (things I know my customers will want) and tiered the pricing to scale to different needs of different customers. I’ll be tweaking the plans I already created and adding more as I see fit. Like I said, the game never ends. I restricted myself to only using my product Marketers Delight for many reasons. From a product standpoint, it’ll help me sell more copies of it. If a service plan is too expensive for you, I’ll sell you the software for a lower price than a service and teach you how to use it. Everybody wins. A more important reason for limiting my services only to MD is because, well, it makes the product so much better. I’ll get to install it on more sites, find more bugs, and see firsthand how people want to use it. This feedback all goes back into its development and makes for a better product overall. On top of that, working with other themes on different sites became very laborious. Since I was using someone else’s product, any time I ran into an issue I would either need to wait for the company to fix it or dig into and learn code that wasn’t mine to fix it. This was great for learning, but a waste of my clients time. Now that I’m in house with my own product, I’ll know almost immediately what is happening when I run into any issues. Even if you don’t have your own product, as I didn’t for so many years, there are tools you are most likely familiar with from mastering your own craft that you could apply to your own services. On my plans page I go over in detail what to expect with the purchase of any plan. I tried to anticipate questions I knew my customers would have and tie them into the sales copy. I’m sure I’ve missed things, but I feel I have a good start. Am I making it clear that iteration is key? With a clear explanation of what to expect (and letting them know I’m available to chat beforehand), I setup each service as their own product and added buy buttons. My eCommerce system takes care of the purchase, and the entire payment is automated. Once the payment is complete, the customer will be directed to a private order page where they fill out a questionnaire I’ve tailored to their service plan. They then send me their order and I can begin completing it. Wow, that was a lot of thinking (you should see my notebooks). Now that I had brainstormed something that felt solid, it was time to build it out. It turns out setting something like this up was pretty easy. Apart from it being my own product and the theme I use on Kolakube, creating the Service Plans page was a simple experience. I built the pricing table with custom HTML/CSS and formatted the content with built-in styles that come with MD (code-free pricing tables coming soon!). Also, MD has support for the other tools I used, EDD and Gravity Forms, so I didn’t have to write any custom code to make them work. MD is a truly great foundation for anyone selling their digital product online. Easy Digital Downloads is the wonderful little eCommerce system I use to sell my products here at Kolakube. It made setting up service plans and adding buy buttons easy with little configuration. EDD is a free plugin and comes with many premium addons that add specific features to EDD. One thing I needed was to make sure only those who purchased a plan could access the order form pages. The EDD Content Restriction addon was exactly what I needed. With just a click from the post editor I was able to restrict access to my order forms to only those who purchased a service plan. This small investment ensures I’ll only be working for my customers and not anyone who stumbled upon the page by accident. There is simply no better way to create contact forms in WordPress than with Gravity Forms. I was able to create different order forms asking my customers for different information in relation to the plan they purchased and easily embed them on those private pages. If you’ve ever worked with a client before, you know that things can get unorganized pretty quickly after days of sending emails to each other back and forth. Creating these order forms and collecting all the important information I needed up front has made communication a lot easier and more organized. If I ever need to refer back to something, I know that the bulk of what I need is in that initial email. 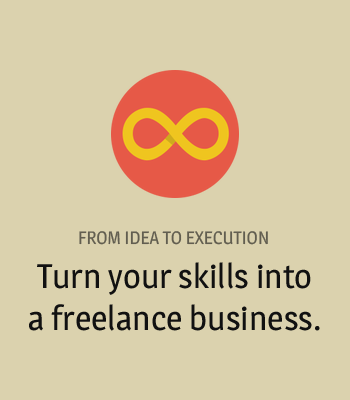 Thanks to WordPress, setting up my automated freelance business was just too damn easy. Once you explore the incredible community of plugins out there you’ll realize that you can do anything. When I first set out to write this post I thought I would be writing a technical tutorial talking more about the tools I used rather than the process I used to come up with this. But in the day and age we live in—and things have changed so much since I got started—the tools you use don’t matter as much as the ideas you come up with. Maybe it’s always been that way, but the internet is full of so many shiny objects I feel that it’s too easy to forget that. The truth is, starting a quality freelance business (or any kind of business) takes actual planning and actual work. There are a million different ways you can do what I just explained to you but the methods you ultimately follow will be in line with your beliefs and experiences to offer the best service you can to your customers. That’s why it’s so important to know exactly what you’re going to bring to the table rather than just jumping on the “make money online” bandwagon. It won’t work any other way. Find ways to automate your business. Find ways to make things easier for everyone involved. But don’t ever do it at the expense of your value. Well done man, and congrats on the next phase of Kolakube. Sharing this process is super helpful. I still haven’t setup my brand new MD theme…I might just need to order one of your service plans. Eager as always to see what you’re up to! Thank you for the great comment, Somone! I’m honored to have been a part of your digital life for so long. 🙂 Australia is a place I plan on visiting one day… anything can happen. I know exactly what you mean as a “non- technical blogger”. While I love code there are times where I just don’t want to deal with it and that’s the model I try to build off of. I have a long way to go, but the more software “just works” out of the box the happier people will be with it. Looking forward to seeing what you do with MD! Love seeing your progress with the new update! Is EDD only set up for software download e-commerce or does it allow for physical products and services? It was hard to tell from their website. Thanks Brice! It’s really just for digital products. I think WooCommerce is what you’d want for physical. Awesome content. Really great context. You might want to think about adding a conclusion. I’m proud that you’re keeping to the website up to date, Alex. I’m excited for you and the success of the service you’re offering. $147 doesn’t sound like a bad investment for the value you’re offering your visitors. Best of luck and I look forward to your future post. Thanks Alex! I’ve been slacking on my writing, but very busy behind the scenes. Can’t wait to show you what I’ve been working on! Visiting kolakube after such a long time. Good to see this blog updated. Reminds me of good old days. #Blogussion. Yessir, plenty on the horizon. Thanks for stopping by, and cool name for your website.